Megan Elvrum: SDCC & the Trolley! 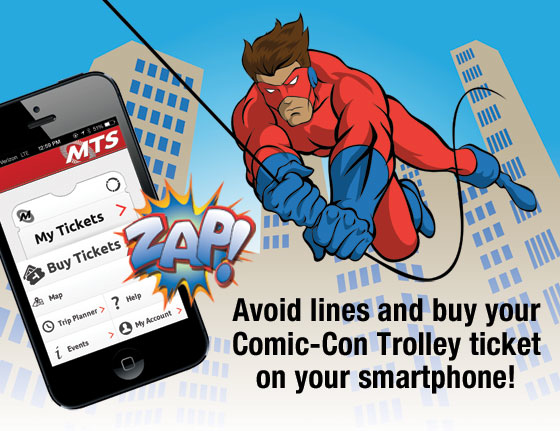 MTS recently debuted an awesome new way for Comic-Con attendees to buy their Trolley passes: they can download the FREE mTicket app and buy/download Trolley passes right onto their smartphone! The phone itself actually acts as the ticket! The mobile ticketing project is still in its pilot phase (mTicketing is currently available only for select special events), so Comic-Con attendees are pretty lucky to be able to do this. No more waiting in long lines at the ticket booth/machine to buy your ticket this year! The more people who buy their passes on their phones, the shorter the lines will be for everyone else at the stations! Win-win! Any more Trolley questions our girl @NerdyGeographer is your go to gal for all things SD Trolley!